V/Line has been a real mess since January. On Thursday 14/1 it was announced a large number of V/Locity carriages were being pulled out of service due to an issue with wheels. The result was lots of cancelled or shorter trains, meaning delays and crowding, particularly in peak hour. More serious than any crowding or delay issues is that some shorter V/Locity trains may failing to trigger level crossings. Again, speculation is rife, but it seems to be related to the types of track circuits used on much of the Metro network. This resulted in V/Locity carriages being banned from most Metro tracks, with many V/Line services either terminating on the city fringe, or being replaced by coaches, causing huge disruption for passengers. Apparently the problem isn’t new — it’s been known about for some years, but rather than spend the money and fix it, it seems running longer trains was seen as a suitable workaround. Until now. The government reaction is to have announced that axle counters would be installed on the relevant Metro tracks — which is good. And they announced a period of free travel — which is bad. It’s not helping regular V/Line passengers by having extra people on the trains while they are at reduced capacity. By the end of the month, V/Line CEO Theo Taifalos had resigned, but of course that doesn’t solve the problem. Investigations continue into precisely what’s caused the problem, and apparently lubrication is now being applied, and lots of wheels being checked and replaced as needed. Let’s hope they get to the bottom of it quickly. Apart from any specific technical problem, there’s a sense that V/Line has had some trouble adjusting from being a regional rail operator to being a hybrid regional/commuter rail operator — heavy passenger loads, crowding, and high-frequency train services perhaps are just something they don’t really have the expertise in (though Theo Taifalos would have; he previously worked for Queensland Rail). 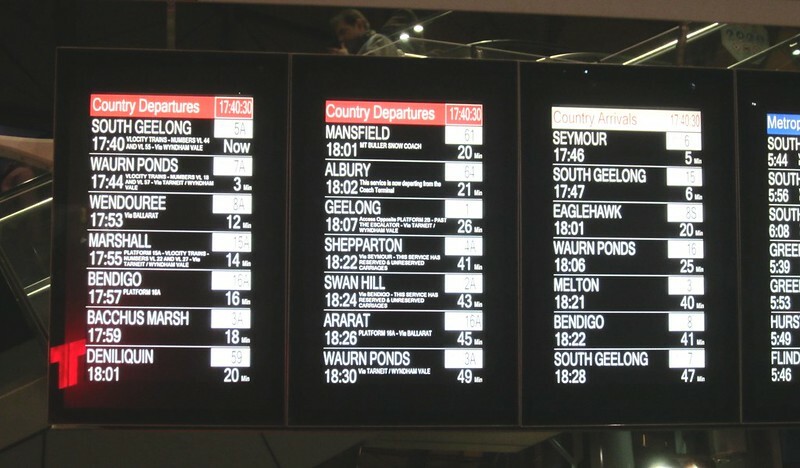 For a simple example, witness the mess that is the Geelong service: on weekdays trains run every 20 minutes, but with a myriad of destinations and departure platforms at Southern Cross — this makes it very difficult for a passenger to navigate their way to the platform. The Age is reporting that the issues really started with cutbacks made in 2010 to Regional Rail Link. The Age has documentation that supports this, something about it doesn’t quite add up. Firstly, design elements such as re-using the North Melbourne flyover (with its tight curves) were decided well before then. My notes show that by May 2009 (when the project was funded by the Federal government) it was already planned to use (but modify) the existing flyover, rather than build a new one. 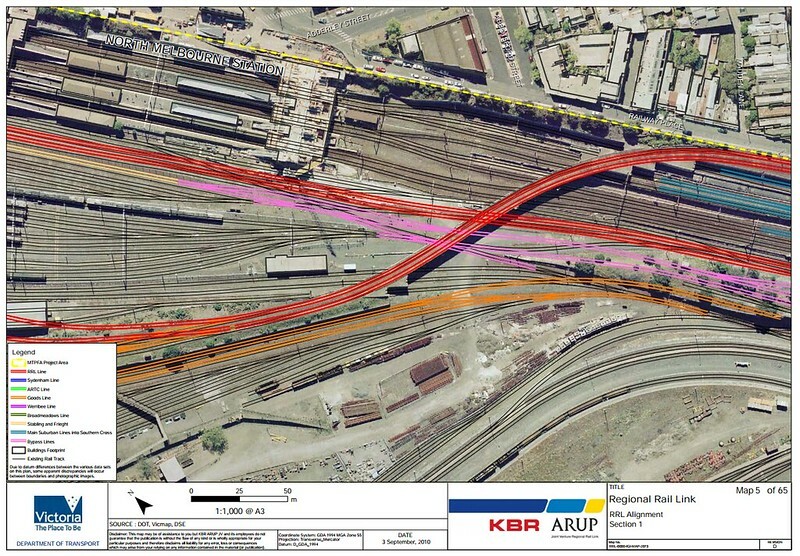 Once confirmed, PTUA raised concerns about it privately with the Regional Rail Link Authority in mid-2009, because using the existing flyover would mean bypassing North Melbourne station — meaning no interchange for V/Line to/from Loop trains. Discussions at the time confirmed that it had been decided earlier, indeed before RRLA came into being. PTUA also raised the issue publicly in early 2010. Around that time, RRLA said they’d review the decision — and apparently they did study some options for a second flyover but ultimately rejected it in 2010. It might be this consideration that was ruled-out, rather than a reduction in the scope of the original design, which never included a new flyover anyway. Secondly, some seem to be implying that the overpass itself is to blame for V/Line’s wheel crisis. Speed and interchange issues aside, there should be nothing inherently wrong with having curves on a railway, provided they meet the relevant track design standards, and the train operator agrees to the design. If subsequently the trains are not maintained in such a condition to use the track, then that’s obviously a problem with the train fleet, not a problem with the track design. Are we really going to build railways with no sharp curves or turnouts from now on, because V/Line can’t or won’t do wheel lubrication? Somehow I doubt it. We still don’t know the full story. And large numbers of V/Line services continue to be replaced by coaches — if you’re hoping to use V/Line, head to their web site and check the service changes for a list. More important than the blame game is identifying the precise issue and how to fix it permanently. This is obviously an unfolding story. Hopefully it’s resolved soon. Update: Correction — The Age FOI document said scope changes happened in 2010, not 2011. Update 4/2/2016: The government says a “stable” timetable (with about 80% of train services running as normal, and the rest replaced by coaches) will start from Monday. Trains will no longer be free, but train-replacement coaches will be. Fair enough. But it sounds like they still don’t know the root cause. The Age reported on Wednesday that Corey Hannett, former chief executive of the Regional Rail Link Authority, made a series of scope reductions to that project in 2010 that have contributed to the current V/Line rail crisis. Mr Hannett did not make the scope changes. 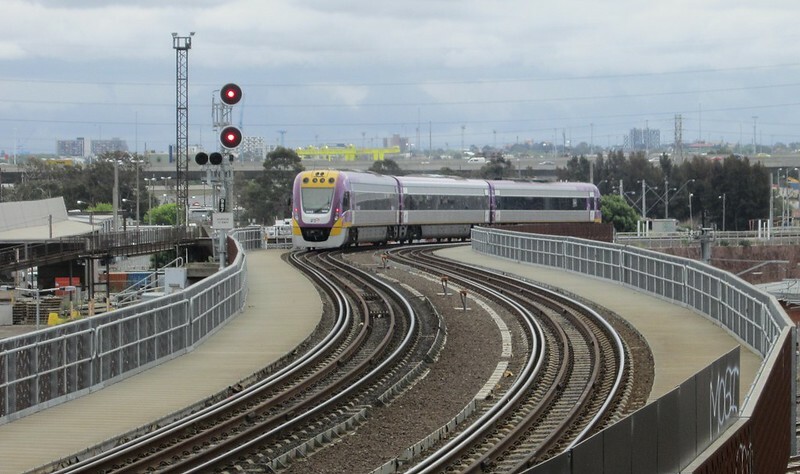 The decision was made by the Department of Transport and approved by V/Line, Metro Trains and the state government. The Age regrets the error. It took a while but today, some time after you mentioned the viewing platform near North Melbourne Station, I visited the platform and the first thing that struck me was the crawling speed of the VLocity trains travelling along the flyover. The trains travelled at an absurdly slow speed. The other thing that struck me was how many trains there were. In less than ten minutes, I reckon about eight VLocity trains used the flyover. Maybe I just struck it lucky. Sometimes it is useful to cast your mind back to cave people times to understand human behaviour. Perhaps casting one’s mind back to steam train days is useful. Steam trains could travel very fast and around quite tight curves. Did their wheels wear excessively? Were the tracks excessively worn? I doubt there was track lubrication but then maybe there were track walkers with oilcans. I suspect recent VLocity wheels are of poor quality. There is steel and then there is steel. I remember the discussion about the RRL bypassing North Melbourne. Given the interchanging I saw today at North Melbourne, I think it probably should have stopped at North Melbourne. Platforms 15/16 should be used exclusively for Geelong line services as it was intended to be from day dot. Surely with the sidings available to these platforms all services on the Geelong line can use these platforms with proper planning. If the tight curves on the flyover are to blame this could be a worthwhile “workaround”. The newspaper comment sections on these type of stories are always full of blame for x political party who was in power for y years. A politician stumbling upon these comments might naively think that all they have to do is be slightly less worse than their opponents rather than doing the right thing. It was put into place on 11/01/2016, with the Weekly Notice describing it as a ‘Preventative maintenance measure’. Is there any reason why on earth that V/Line can’t publish a timetable for their many replacement coaches, like was done during the big RRL shutdowns, and during every single suburban Metro shutdown? From what I’ve seen it’s completely normal at lineside stations for the coach to not turn up until 30+ minutes after the train was due – and standing on the side of a road for half an hour without even a seat late at night, like I had to do last week, is something most would rather plan around having to do. It has been suggested that the cheap Chinese steel used on the wheels are to blame. The recent Metro derailment may be caused by the same. Platform allocation is a common sense thing. With tight turns and flyovers I think revised speed restrictions will be implemented and hopefully that will help along with grease pots found interstate. Cheap Chinese steel used on wheel sets not good hopefully only isolated to a few sets with Metro. It could just be an issue with a batch or so. With trains I thought trains have mileage based maintenance. Something it could be learned from NSW with maintenance. Recently on 3AW, a caller, who claims to be the wheel manufacturer, claiming that the steel used is high quality sourced from Australia. I can not help think, it could be the same combination of all causes in that list. The wheels may have been ok with either one of those items, but in combination it becomes just too much. What V/Line needs to do is, get a fleet of V/Locities with brand new wheels, and keep each one of those captive on respective lines or routes. Then check which ones wear out quickest.